From structural steel to decking and everything in between…you're covered. East Coast Metal Structures Corp and Florida International University’s College of Engineering and Computing have established a partnership to benefit the academic achievement of FIU’s students. Prior to graduation, Senior FIU undergraduate students participate in a three-part training program provided by ECMS. 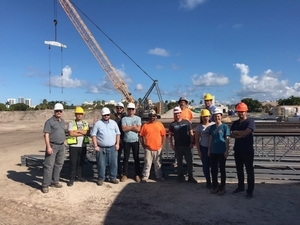 Students receive classroom instruction on steel industry operations and technical applications, observe fabrication operations at both ECMS production facilities (our structural steel is in Riviera Beach, FL while our miscellaneous metals shop is in Lantana, FL) and travel to an actual project in construction. Through this, students are able to observe real-time, practical instruction on the many facets of erecting and securing steel material. James Norvell, our Director of HR & Safety, takes the lead on these programs to ensure all safety measures are met and the students receive the best learning experience possible. Working with Florida educational institutions is something we will continue to do for many years to come. ECMS is a proud contributor to the many educational institutions across the state of Florida.